If you happen to find yourself in, or around Cape Town between June and November, do make sure to look out for Whales! Contrary to what many may think, whale watching in Cape Town can be pursued just around the corner from Mother City. Southern Right Whales visit the bays of the Cape, from the West Coast, down and around to Cape Town’s Table Bay and False Bay and all the way to East London. The Southern Right Whales visit these southern shores of the Cape to enjoy the protection of the many bays and calmer sections of water to give birth and nurse their young. A Southern Right Whale's tail elegantly breaks the surface, briefly revealing some of the splendour of this mysterious creature. Whales can very often be spotted from land around Table Bay and False Bay for instance, just a few kilometers from the Cape Town city centre. This allows visitors to take prize photos and great stories home about their adventures whilst whale watching in Cape Town. Hermanus, about an hour and a half’s drive from Cape Town is arguably the best spot for land based whale watching on the globe. A major part of Hermanus and surrounding region’s economy, relies on the “Whale Watching Trade”. With Hermanus businesses and services always ready and keen for the tourist influx during the whale watching season, it is certain that you will not be disappointed. At one of the prime spots near the town centre of Hermanus, whales can be seen from land, just a few meters away, performing their antics. Often a cow and a calf appears, a lazy adolescent splashes her huge tail on the surface and then … a huge bull appears from nowhere and launches into the sky crashing down from a massive breaching manoeuvre …. and all the while the tourist camera’s capture one prize winning picture after another! Whale watchers can take advantage of the great views facilitated by the elevated rock formations all along the coastline and a paved trail, the “Cliff Path” hugs the coastline all around town. A good section of the Cliff Path between the Marine Hotel and Village Square is 100% wheelchair friendly! 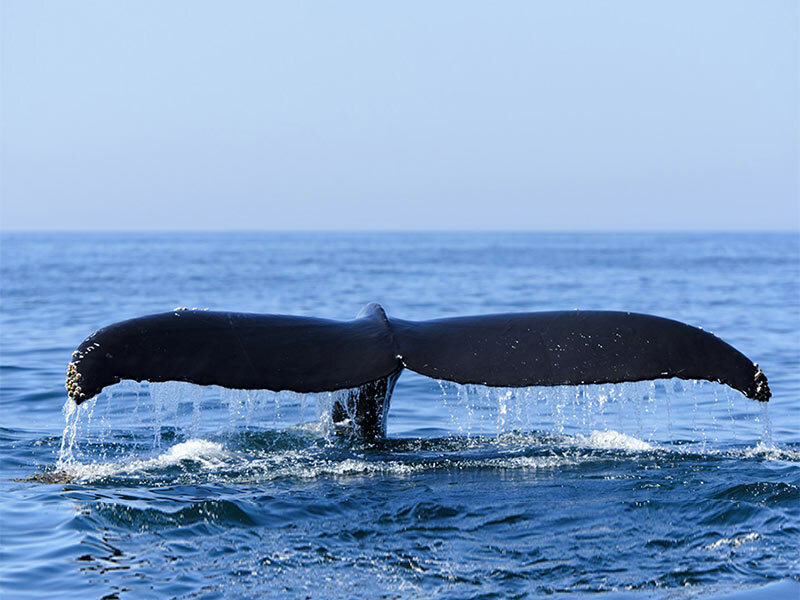 Many boat trips depart from Hermanus, allowing stunningly intimate whale watching experiences that are rarely forgotten. For those who come to enjoy the many wonders of the Cape, like whale watching in Cape Town, Bayview House offers an excellent choice of accommodation options. Stunning rooms, 360 degree views of the mountains, City Bowl and Table By, great architecture and top class facilities makes Bayview House the regular choice of discerning travellers.